They may not be the flashiest parts of your vehicle, but without properly functioning belts and hoses, your vehicle won't get very far. Your vehicle has some critical belts such as the serpentine belt. This belt helps drive the water pump and many other engine components so that they can function. Coolant hoses help deliver antifreeze to the engine. When you’re involved in a car accident, it’s important that you take a few necessary actions. It will ensure that you protect yourself physically and financially. There are a few phone calls to make. The first is to the police department so that they can send out an officer. The second is to your insurance company so that you can report of the accident. The Lincoln MKZ is a favorite midsize luxury sedan featuring convenient technology and style. The Lincoln Way App connects the owner to personalized customer service. These benefits are connected through the vehicle offering safety features such as remote lock and unlock access and roadside assistance. Additionally, the convenience of scheduling a pickup for vehicle serving and parking reservations are part of the concierge service. Usually, larger vehicles have a hard time driving up and down hills due to their size. However, Lincoln has found a solution for drivers with the 2018 Navigator. This SUV is available with safety features that help you maintain control. The first feature is Auto Hold. It's designed to prevent your vehicle from rolling back when you're stopped on an incline. 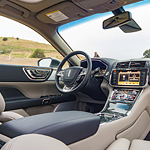 The new Lincoln Continental is the popular luxury car that has several technology features you will need to really see to appreciate. 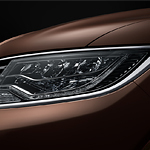 The adaptive HID headlamps that come in the new Lincoln Continental will have you driving more safely at night. When the vehicle is going around a curve, these lights swivel to help increase your visibility in any weather conditions. If you are moving at a slower speed, the beam of the lights will widen to help you to see further. One of the most popular crossovers out there, the Lincoln MKX is not only known for its towing capacity, but it excels when it comes to its low starting MSRP along with its number of standard features. There is a lot to love about this vehicle, with certain aspects that may determine whether or not this is the car for you. Knowing how to safety replace a tire on your vehicle that's gone flat is a great skill to know. Our service technicians at Vision Ford - Lincoln LLC want to pass along the following tips so that you can safely fix a flat in no time without incurring any injury. One way to identify an issue with a leaking exhaust in your vehicle is to simply listen for it. Around the engine block or tailpipe, you want to pay attention to any unusual hissing or popping noises. These sounds will also be followed by a higher pitch whistling, all signs of concern and issues that need to be brought to the attention of a mechanic.